With the completion of the majority of the facilities at the Edmonton Waste Management Centre, the level of capital investments is projected to begin returning to the pre-landfill closure level. Investments for 2012-2014 focus on meeting needs to serve a growing City, and ensuring existing capital infrastructure is up to date and operating efficiently. Phases 1 and 2 of the Integrated Processing & Transfer Facility (IPTF) completed. Construction started on the Biofuels Facility by Enerkem Alberta Biofuels. Construction started on the Closed Loop Recycling Facility by Greys Paper Recycling Industries LP. Construction started on the Kennedale Facility Expansion. Advanced Energy Research Facility completed. 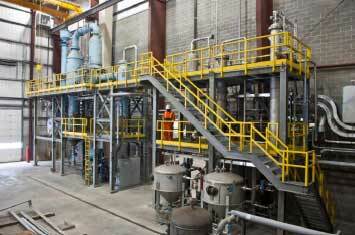 Closed Loop Recycling Facility (for office paper) by Greys Paper Recycling Industries LP to be completed in 2012. Phase 3 of the Integrated Processing & Transfer Facility (IPTF) completed. This phase will produce feedstock for the Biofuels Facility. Construction projected to be completed on the Biofuels Facility by Enerkem Alberta Biofuels. Kennedale Facility Expansion to be completed in 2012. Infrastructure rehabilitation at the Edmonton Waste Management Centre and Eco Stations in 2013 and 2014. This investment expands, rehabilitates and replaces existing systems as they reach capacity or are at the end of their useful lives. Northeast Eco Station to be completed in 2013. Ongoing acquisition/replacement of collection vehicles, equipment and containers. Waste Management Services capital projects are funded through the utility, and are not tax-supported.